Burundi Justice Minister Aimée Laurentine Kanyana say goment don release di three schoolgirls wey dey prison sake of say dem draw Jaga-jaga ontop President Pierre Nkurunziza pishure for dia textbook. Di minister say dem don release di girls age wey dia na 15,16 and 17. "We want parents dem to chook eye well-well for dia pikin education. We dey draw ear give pikin dem make dem respect authorities, she add say di age of criminal responsibility is 15," dat na wetin she tell tori pipo RTNB. Di girls wey don dey prison detention for two weeks ontop accuse say dem insult di kontri head of state make plenti pipo para well-well for social media. 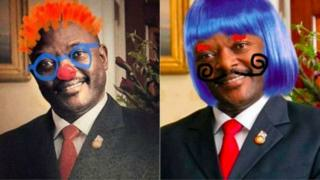 Pipo vex sotey dem do campaign with hashtag #FreeOurGirls, na so pipo begin post funny- funny pishure of di president with clown wigs and hats dem. Your hairstyle fit dey make your hair fall comot?